The Solfège system is without doubt an excellent way to promote vocal training. You can learn to hit tones and intervals better and move in the key and on the pitch of each piece of music without problems, if the root tone is specified. If we use movable do we transpose all scales to C major. This, however is something that we really want to abolish with any alternative notation. Irving Berlin avoided transposition by using a special piano. Transposition can be avoided if one uses dozenal numbers such as in Hamburg music notation or other cipher notations. To sing numbers works well in some languages with one syllable words for the digits up to a dozen. However this does not sound very good. 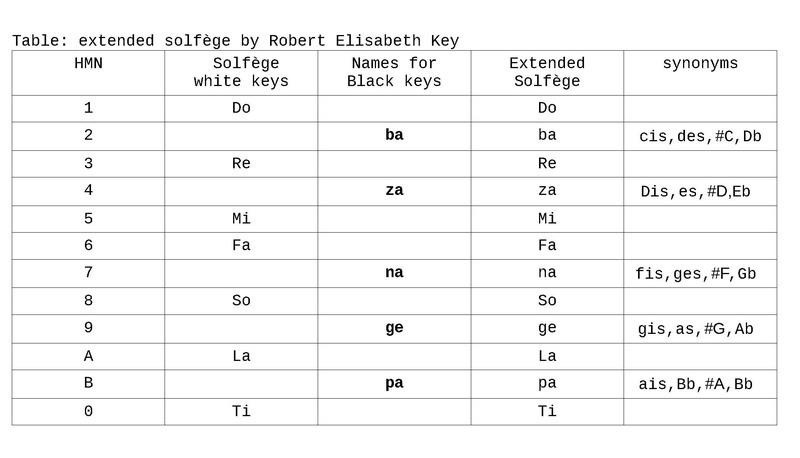 Then I learned the proposal by Joe and others to expand the solfège system and name the black keys. A friend suggested to use syllables that sound more “italian” since solfege is of italian origin. I propose to use solfège with slightly different syllables as proposed by Ann Glover (do, re, mi, fa, so, la, ti, do) that are frequently used in relative solomisation for major scales. See wikipedia for Ann glover and relative solomisation. Once you are familiar with the dozenal nature of music you can use any twelve names to characterize the twelve digits. See the extensive literature on that subject in the publications of the dozenal societies of America and Great Britain. If five syllables are added for the black keys this clarifies the position of each note and if you combine this with the corresponding number for each position you can move easily within that system. Then there is no need for complicated fixed-do naming systems as suggested in wikipedia 2015 section solfège. My Proposal is to use the five syllables ba-za-ge-ne-pa as names for the black keys. Advantages are: the syllables sound “Italian” if za is pronounced like in zappa = hoe and if ge is spoken like in angelo = angel. Each number ( syllable) begins with a different consonant DbRzMF nSgLpT. So that each syllable can be recognized by its first letter, and numbers can be replaced in our software by the by the correct consonant. Black keys start with small letters. Vowels in the sequence DobaRezaMiFa naSogeLapaTi are found the same in number but in different order in the groups123456 = DobaRezaMiFa and 789AB0*=naSogeLapaTi. This is probably the reason why the syllables sound pleasant to us. The sound of solfège remains the same. Everybody is invited to discuss the examples on youtube demonstrating that these syllables are easy to sing and sound good. It helps to hit the correct pitch and might even be of help to recognize dozenal numbers and become familiar with the dozenal system. In addition this system can be used without changes in conventional notation.